On a recent family vacation to Florida, I decided to give Roam Mobility a try. As most of us know (and many of us find out the hard way), roaming in the US is expensive. While Canadian carriers offer US Roaming packages, many users aren’t aware of them, the pricing is often much higher than is reasonable, and even their more recent offerings aren’t that competitive. We’ve all heard horror stories of people with $22,000 phone bills, and while many think that claiming ignorance of roaming fees shouldn’t be an excuse for not paying your bill, there must be a better way to get service south of the border. There is, and it’s Roam Mobility. Roam Mobility is a Canadian company based in Vancouver who offer several options to get service in the US, including the Breeze Phone for voice and text, the Liberty mobile hotspot, and the Roam Mobility SIM. 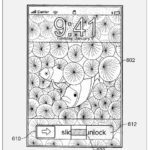 If you have an unlocked phone, the SIM is a great option. As far as plans go, Roam Mobility offers 3 options. They have a data only plan starting at $0.06 per MB which is intended for devices such as their Liberty Hotspot, a talk & text plan starting at $3 per day, and a talk, text, & data plan starting at $4 per day. 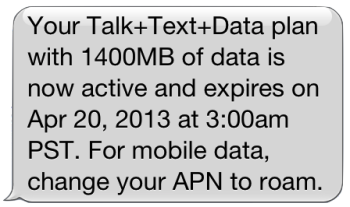 The $4 plan provides 100Mb of data per day and is available in several increments (1, 3, 7, 14, and 30 days) as needed. 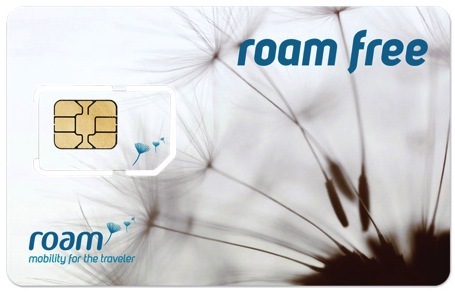 You can obtain a SIM via the Roam Mobility website or from their network of local dealers. They offer both a full size / microSIM card, and a nanoSIM card for iPhone 5. I work in downtown Toronto and was easily able to locate 2 dealers via the Roam Mobility website, both less than 10 minutes away by foot. The SIM itself costs $19.95 and is valid for 1 year, however as long as you use your SIM at least 1 day per year it will remain valid and not expire. After purchasing the SIM card from a Roam Mobility dealer you must create an account on the Roam Mobility website and then activate the SIM to tie it to your account. At that point you can select your desired plan and specify when you would like it to start. You can choose to have the plan activated immediately (within 15 minutes) or choose a date and time if you will be travelling in the future. If you are purchasing the SIM via the Roam website then you can perform all these tasks at once. If you have a Roam Mobility SIM and are already in the US, you can choose to top up your plan via text message by sending the word “topup” to 7850. The process of creating an account, activating the SIM, and selecting a plan was very simple. In my case I’ve got an unlocked iPhone 5 so I purchased the Roam Mobility SIM and signed up for the Talk/Text/Data plan. When I arrived in the US I removed my existing Fido SIM and inserted the Roam Mobility SIM. After a minute or so the phone connected to the Roam Mobility network and I received a text message advising me that my chosen plan was now active. 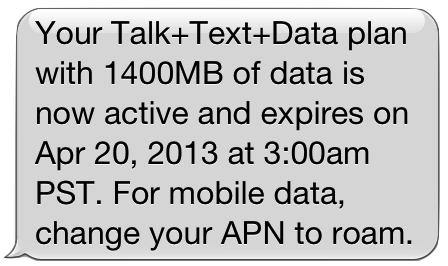 Note that it is recommended to change your iPhone APN to use the Roam data network. Further information can be found online. In my experience, everything worked very well. The ability to have unlimited calling anywhere in the US and to Canada was great, and call quality was excellent. I never experienced any dropped calls or poor signal quality. I don’t text much since most of my friends use iMessage, so I didn’t really have an opportunity to use this feature, but it’s there for people who do need it. Data service was very reliable and the connection varied between 3G and Edge depending on location. In the US, Roam Mobility uses the T-Mobile network which supports the AWS spectrum (1700/2100MHz), so from a data perspective your device needs to support AWS to get HSPA+ (3G) speeds nationwide. Of course, the iPhone doesn’t support AWS so users can expect to get Edge data speeds in most non-urban areas. However, the new version of the iPhone 5 that Apple recently announced to support T-Mobile does have AWS spectrum (1700/2100MHz) support and will provide HSPA+ speeds nationwide. So, if you are lucky enough to get one then you’re good to go. For the rest of us, the T-Mobile network is currently being upgraded to support HSPA+ on the 1900MHz band. This modernization is live in over 40 metro areas across the US, giving iPhone users HSPA+ (3G) speeds. LTE speeds are currently not available to Roam Mobility customers, however, they are discussing the possibility with T-Mobile as a future offering. More info on data speeds can be found online. In my experience, Edge vs 3G ratio was about 50/50. I was in Orlando which has been upgraded to support 1900MHz so for the most part I had 3G coverage throughout the city and in the surrounding areas. Outside of Orlando service dropped to Edge speeds which are slower, but still fully functional. I was able to check email, message friends, keep track of happenings on Twitter, and post pics to Instagram or Tumblr while out and about. I went on a tour of Launch Pad 39A (very cool!) at Kennedy Space Center and was able to express my inner geek by posting pictures of the flame trench while standing in the flame trench. Definitely a better experience than running around looking for an open WiFi network at Starbucks or McDonald’s, and certainly far better than worrying about how much you’ll owe the Big 3 when you return home. I’ll definitely be using Roam Mobility the next time I head to the US, whether it’s a 1 day shopping trip to Buffalo or a multi-day family vacation. While Roam Mobility is currently US-only, they are talking to carriers in other countries about expanding its network into Europe and Asia. If you’re interested in keeping up to date with the latest Roam Mobility news, consider following their Twitter (@RoamMobility) and Facebook accounts. After travelling in the US with Roam Mobility I can definitely say that their service is worth checking out. No matter how long you’ll be in the US or where you go while you’re there, you’ll be able to keep yourself connected without having to overpay for roaming packages from the “Big 3” or coming home to a data roaming bill that exceeds the GDP of a small nation-state. It’s great to see a Canadian company take the initiative and come up with a solution with something for everyone, all at a very reasonable price. Do yourself a favour and check out Roam Mobility the next time you’re considering a trip to the US. How about you? Have you used Roam Mobility in the past or are you considering giving them a try on your next US trip? Let us know in the comments. Disclosure: Roam Mobility provided us access to their network for this review.